Homer’s (c. 800 BC) Iliad and the Odyssey are considered by some to be the foundation works ‘from which all European literature derives’ (Watson). Composed in hexameter verse in about the 8th century BC, the narratives of these two epic poems have had a wide-ranging influence on western literature of all genres. Shakespeare was inspired by the Iliad for his play Troilus and Cressida; James Joyce took inspiration from Homer’s Odyssey for his Ulysses; and how can we forget Brad Pitt’s semi-naked portrayal of Achilles in Troy (2004), a movie loosely based on the events described in the Iliad. 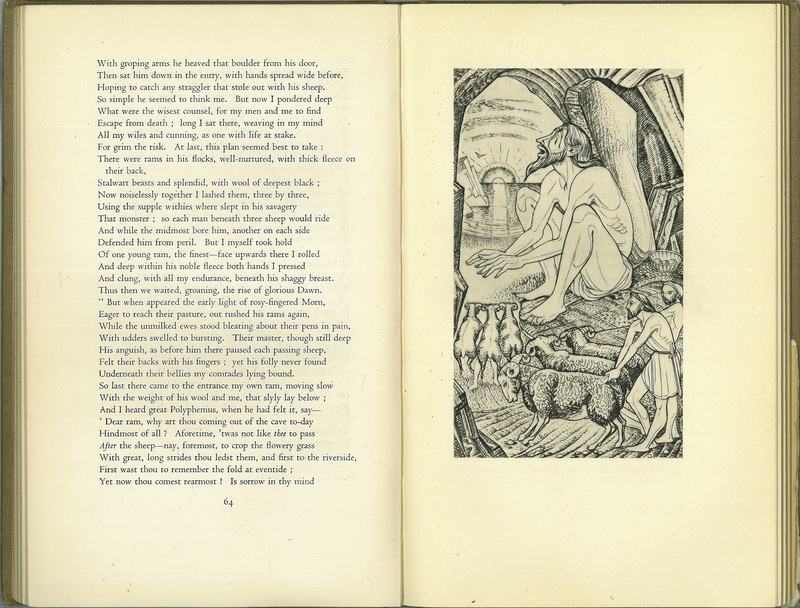 Displayed here is John Buckland Wright’s interpretation of Odysseus’s escape from the cave of the Cyclops Polyphemus. Homer, “The Odyssey,” ourheritage.ac.nz | OUR Heritage, accessed April 26, 2019, http://ourheritage.ac.nz/items/show/7858.